If you smoke, averaging $5 a day, that’ll run $35 a week and more than $1,820 a year. Quick fix: Give it up and do your lungs (and budget) a favor! If you can’t, at least try to cut back. 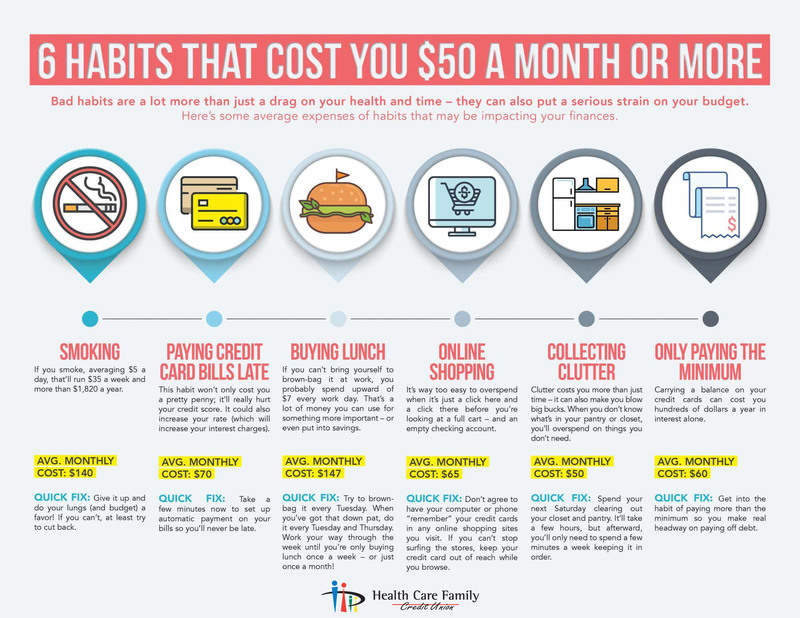 This habit won’t only cost you a pretty penny; it’ll really hurt your credit score. It could also increase your rate (which will increase your interest charges). Quick fix: Take a few minutes now to set up automatic payment on your bills so you’ll never be late. If you can’t bring yourself to brown-bag it at work, you probably spend upward of $7 every work day. That’s a lot of money you can use for something more important – or even put into savings. Quick fix: Try to brown-bag it every Tuesday. When you’ve got that down pat, do it every Tuesday and Thursday. Work your way through the week until you’re only buying lunch once a week – or just once a month! It’s way too easy to overspend when it’s just a click here and a click there before you’re looking at a full cart – and an empty checking account. Quick fix: Don’t agree to have your computer or phone “remember” your credit cards in any online shopping sites you visit. If you can’t stop surfing the stores, keep your credit card out of reach while you browse. Clutter costs you more than just time – it can also make you blow big bucks. When you don’t know what’s in your pantry or closet, you’ll overspend on things you don’t need. Quick fix: Spend your next Saturday clearing out your closet and pantry. It’ll take a few hours, but afterward, you’ll only need to spend a few minutes a week keeping it in order. Carrying a balance on your credit cards can cost you hundreds of dollars a year in interest alone. Quick fix: Get into the habit of paying more than the minimum so you make real headway on paying off debt.